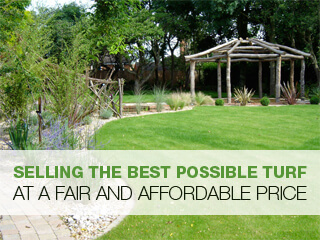 George Davies Turf has been trading since 2001 and our Garden Turf in Leighton Buzzard can meet a range of commercial and residential requirements. We now supply to over 35 golf courses in the UK, as well as leading housing developers, so we’re equipped to carry out small and large orders in Bedfordshire. We’ve expanded a great deal over the years, but our prime aim is to provide excellent products with the best possible service. Whether you require a new lawn, low maintenance border fillers or top dressing products, we deliver items in Bedfordshire quickly, in perfect condition, even when temperatures rise (thanks to our large chiller units). If you require further information on our Garden Turf in Leighton Buzzard, then you only need to get in touch with a member of our team, while you can also find our complete breakdown of items in the ‘products’ section on our website. We’ve developed relationships with homeowners, landscapers, local authorities, golf courses and landscape architects, and we’re always on hand to guide you through the most suitable options for your landscaping needs. We only supply first-class products from established, UK based producers, and our turf grades are carefully created to deliver a vibrant green colour all year round. No matter where you want your items placed in Leighton Buzzard, we make sure they get delivered to the spot, and our state-of-the-art lorries with rear steer axles can manoeuvre into the tightest of sites. George Davies Turf is much more than just a turf supplier. We’re an expert in our field, and our dependable team is always happy to guide you through the options most relevant to you and your landscaping project. We make deliveries in Leighton Buzzard all year round, but we want to make sure you get the right product for your requirements, so if you’re not entirely sure on the Garden Turf you require, we’re always here to offer advice. We’ve adapted our products and services over the years to exceed our clients expectations, and we usually make anywhere between 100-120 deliveries a week. To speak to us about your next landscaping project in Bedfordshire, contact George Davies Turf today on 01234 714555 or 01727 821 765, or you can email us using our contact form.